The Tata Tiago is likely to get a new top-spec variant called XZ+. A leaked image of the new variant suggests that it could get larger alloy wheels and more features. The Tiago XZ+ is expected to get 15-inch dual-tone alloy wheels that are offered on the Tigor petrol. It also borrows the twin-pod projector headlights and grille from the compact sedan as well as electric ORVMs with integrated turn signals. Reports suggest that the XZ+ variant will be offered in two new colour options - Etna Orange and Titanium Grey. Both are likely to get contrast black roof panels. On the inside, the Tiago XZ+ is expected to get features like a 7.0-inch touchscreen infotainment system with Apple CarPlay and Android Auto connectivity options and automatic climate control. The XZ+ variant is expected to be offered with the same 1.2-litre, 3-cylinder petrol engine that makes 84 BHP @ 6,000 rpm and 114 Nm of torque @ 3,500 rpm and the 1.05-litre, 3-cylinder diesel that puts out 69 BHP @ 4,000 rpm and 140 Nm @ 1,800-3,000 rpm. Both engines could be offered with a 5-speed manual transmission. It is still unclear whether Tata would offer the automated manual transmission (AMT) on the top-spec Tiago. Now, Tata deletes the Tiago's rear wheel well cladding! 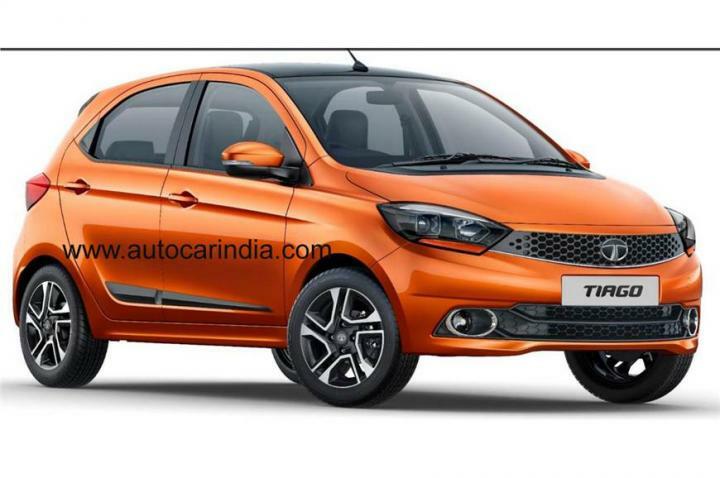 Tata Tiago: 2 lakh sales up!